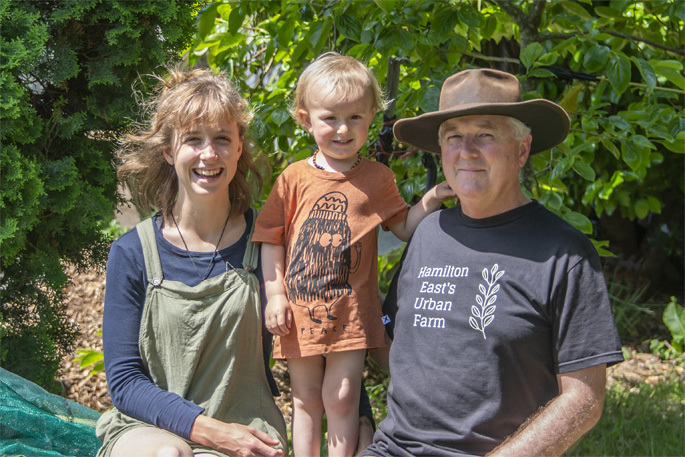 Three generations of urban farmers; Effie McLeay, Luka McLeay and John McLeay. A series of events and a desire for change led to two generations of the McLeay family developing their 1700m² section in Hamilton East into a flourishing urban farm. Empty-nesters, barrister John McLeay and his wife Sarah, a local body adviser, were considering options and eager for change. Around the same time, their 20-year-old daughter Effie, mum to two-year-old Luka, also needed somewhere to live and some family support. John says there wasn’t really a plan made, it was more events that made the plan for them. Effie had spent two years living at Wilderland in the Coromandel, and had experience in the concept of self-sufficiency and growing food within a small area. “We wished we could have had more time with our children as they grew up, and Effie was interested in having a business at home and being with Luka,” says John. Twelve months ago, John left his job and joined forces with Effie growing microgreens for the Hamilton Farmer’s Market and some hand-picked local cafes. “We did our research first, and felt we could handle the short growth period of microgreens and keep in sync with market requirements,” says John. There was no huge injection of cash into the venture, it has grown more organically, making use of opportunities and ingenious problem solving to develop the business. The typical ‘kiwi can do’ attitude shines through strongly here. “Our first poly hot house was ‘rescued’ from the local community centre for $50, and was carried aloft by five people for about 1km, much to the amusement of the locals,” says John. One of the first issues was learning that seeds don’t germinate in the cold, and delicate shoots are not at all frost hardy. Heating a poly hot house is not economically viable, or particularly efficient, so John deduced that they already heated the house, so why not use the house to germinate the seeds. Simple commercial, metal shelving units from Bunnings are strategically placed around the dining area, with neatly arranged seed trays, sown with Kings Seeds, on each shelf – a compromise for not overrunning the house, but achieving germination. “Germination takes from four to seven days depending on the seed type, and then the trays are moved out to the poly hot houses for a further seven to 10 days, and finished off in the shadehouse,” says Effie. Effie and John are very mindful of what goes into their soil, and do not use any chemical fertilisers or weed killers. They make a limited amount of their own compost from food and garden waste, and have a worm bin. Windrow compost is bought in for the seed raising mix, from sources using chemical-free greenwaste. Beds are prepared for the greens, which are grown on to salad green stage. Cloche tunnels with nets not only provide some weather protection, but deter butterflies and other insects. The farm isn’t regimented rows of tidy beds, but the seemingly random positioning is a carefully controlled business, ensuring there is a constant supply of shoots coming on at all times. The cafes can expect their delivery to have been washed, packed and delivered ready to eat within hours of cutting. The business is registered with council as a food seller, and John has been experimenting with environmentally friendly packaging for their product. As environmental awareness and a desire to reduce the use of plastic spreads, John has noted that around one-third of their customers will bring their containers back. His financial and analytical background is never far away, and he’s turned his mind to looking for economically-viable hot composting solutions, both commercially and domestically. While all parties are currently enjoying the three generations living and working together, long-term Effie would like her own place, and be able to earn enough money doing what she loves to support Luka. The urban farm is continually evolving, space is utilised well, and provides a modest income. Neither John nor Effie are in a hurry to expand, but have added edible flowers to the produce grown this summer, a colourful hit with the café crowds.